Colophon Books are specialists in the fields of antiquarian and in-print books about books, literary first editions, and military history, especially World War I Aviation and World War II Aviation. They have a large selection of books about books, typography, fine press, binding — and even a selection of posters designed by Lance Hidy, all of which you can scroll through on their site. 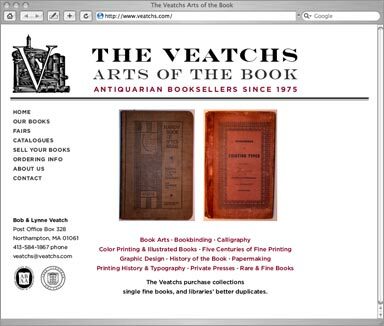 Bob & Lynne Veatch, fine press and antiquarian booksellers since 1975, have recently updated their website. Visit their new site to browse their offerings of books by Bird & Bull, Gehenna, Pennyroyal, Warwick, Double Elephant, Officina Bodoni, Whittington, Fleece, and dozens and dozens of others. See for yourself here.